Thanks. I thought I looked like an idiot, but the guy I live with disagreed. 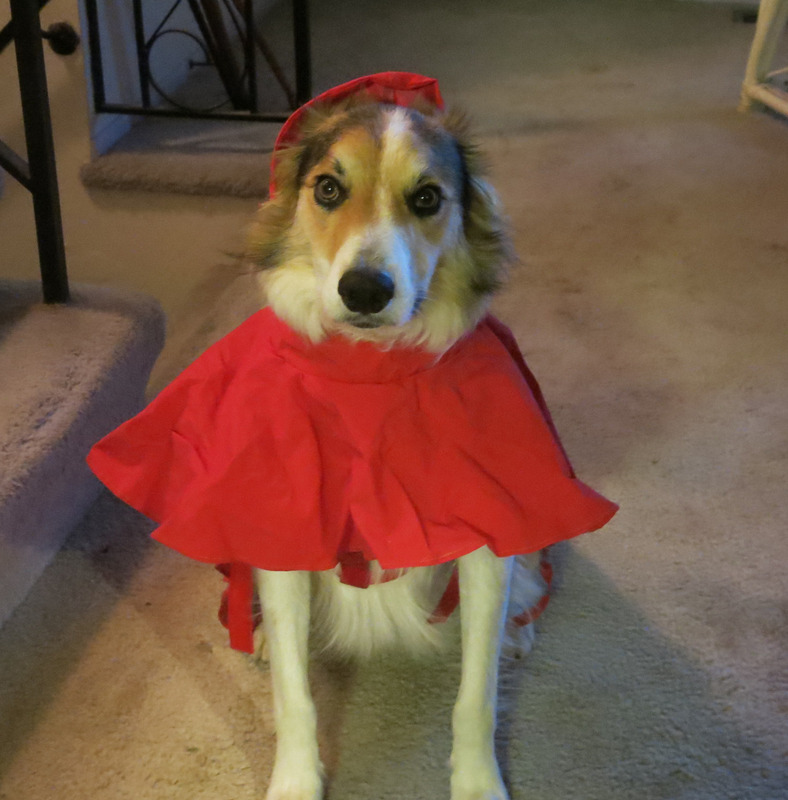 Red Riding Hood! You are adorable, Mani! Thanks; it wasn’t as embarrassing to wear the poncho as I thought it might be…. Mani, you are looking very handsome! Thanks. I look better without the poncho, I think. It is. We’re not having roofers, though. And it’s still raining. Tres chic, magnifique Mani. Oh la la! Thanks; the late Pooka, the second purebred border collie who lived here, and whose poncho this was, wore it very proudly. And it’s still raining. I have a raincoat. The guy I live with doesn’t. So there. That’s what I would say. I hope the guy you live with gave you extra treats for both wearing the poncho AND letting him posting the picture on the internet… So cute! I did get extra biscuits, thanks. Looking very continental. Have the guy you live with play some Noel Coward music after your walks. You know, while he’s toweling off. The guy I live with doesn’t have any Noel Coward music ….. I have gotten used to be dried off with the towel, though. Instead of attacking it, like I did when I was little. Hey, some rain! Hope TGYLW is pleased. Thanks; I think I’m handsome all the time, but the guy I live with says that “immodest”. What does he know? Yes, he is indeed pleased. Almost an inch of rain in two days. He said the bulbs in the garden would start to wake up, now.